Break your holiday dry spell with a trip to Dryden, Ontario. This beautiful city on Wabigoon Lake is a fantastic place to seek a little leisure. Parks, festivals, and an artsy vibe offer fun opportunities for people of all ages. This area has long been a popular place for people to gather; indigenous groups from all over North America met in the land that would become Dryden to trade goods long before city streets were paved. Mining and agriculture slowly became staples of the local economy as the city developed. These days, Dryden is best known as a great place to enjoy some fresh air and relaxation. 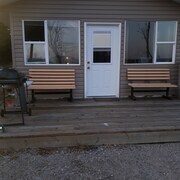 Are you looking for cheap deals at hotels in Dryden? Stick with Expedia.ca for amazing discounts that will help you keep more spending money in your pocket. Who says great vacations have to include long lines, crowded venues, and pricey attractions? It’s time to discover why so many people adore Ontario’s Kenora District. It won’t take you long to realize that Dryden’s pride and joy is the enormous statue of Max the Moose, which can be seen from the Trans-Canada Highway. The downtown area features great art galleries and plenty of cute little places where you can grab a mug of hot chocolate. Simple pleasures and serious beauty are what await you in Dryden. The seasons really keep people on their toes in Dryden. Whether you’re coming for a cozy winter holiday or a fun summer getaway, Dryden hotels offer everything you need to be prepared for fun. Plan for temperatures below freezing and a fair amount of snowfall if you visit during winter. Temperatures stay chilly when spring rolls around. Summer ushers in temperatures between 18 and 23 degrees Celsius. Fall usually experiences temperatures near 5 degrees Celsius. We tend to think that a slight nip in the air makes every festival and casual frolic feel a little bit more magical. You’ll find parks galore in Dryden. Lace up your boots and head to Aaron Provincial Park, Blue Lake Provincial Park, Kinsmen Park, and Lola Lake Provincial Park. You’ll love exploring slices of local history at the Dryden & District Museum. Of course, canoeing and kayaking are popular here as well. Don’t forget to head to the Wilson Suspension Bridge to snap some beautiful photographs to share with friends back home. We’re here to help you stick to your budget while planning your upcoming adventure. Why not fly to Dryden and a grab a great hotel room for one low price? Talk to our friendly travel experts about reserving an all-inclusive package to save some serious dough. 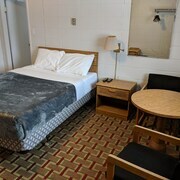 We have outstanding discounts at hotels in Dryden, Ontario that are posh, cozy, and perfect for the whole family. Save money without skipping a minute of fun and book Dryden deals from Expedia.ca today.